A U of T historian's unique essay exploring the experience of estrangement through art has won the prestigious Notting Hill Editions Essay Prize. 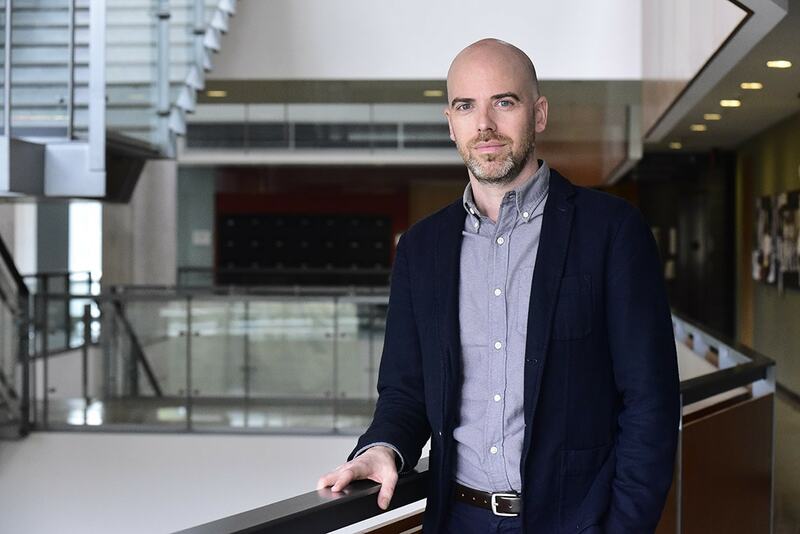 Assistant Professor William Nelson, an expert on the Enlightenment and French Revolution, won the top prize of £20,000 ($33,000 CDN) for his essay Five Ways of Being a Painting. Judges were impressed by the way he was able to combine text and images, weaving together how historical figures from Europe and China – and even his own memories from childhood – form the experience of estrangement. Nelson says the experience of estrangement explored in the essay is a subtle one, a way in which people can step outside of themselves in order to reassess aspects of their life. He originally drew inspiration for the essay from a few sources, including a photograph of German philosopher Walter Benjamin who had talked about being totally immersed by looking at objects as a child, and from Chinese artist Liu Bolin who is known for immersing himself in environments for his artwork. Nelson also was inspired by a piece of art criticism for the Salon written by the French Enlightenment philosopher Denis Diderot. In it, Diderot eloquently describes going on a picnic with a priest and some students before Diderot sets off on a walk around the French countryside. It’s only after the description that Diderot reveals he’s actually talking about a specific painting – not a personal experience. “It’s an interesting example of being a painting by placing himself inside the art he’s describing. It’s a very creative way to tell readers about the painting, but it also allows them to believe that they took this imaginative leap,” Nelson says. While Nelson started collecting his thoughts for the essay about three years ago, it wasn’t until he learned about the Notting Hill prize that he fully committed himself to finishing it. What’s remarkable is he was able to complete the essay while teaching a full course load, writing an academic book and raising his young son. He was so busy that he committed to writing sections of it on his iPhone at night before going to sleep. Nelson was joined by his family for the award presentation in London, England. He says he was surprised that he could focus on the words without getting too overwhelmed. The majority of the finalists who were shortlisted are professional writers, making Nelson’s achievement that much more remarkable. From the time he started graduate school, he’s been studying non-academic forms of writing in order to sharpen his skills. He adds that an important part of being a good historian is engaging with people. “I wasn’t quite sure what I wanted to do with this idea that took shape when I started three years ago. I kept returning to it, refining it and set a goal to do a small section each night on my phone,” he says.